Almost every week we see something new from Facebook, whether it’s a different font, button or new features for Pages, Messenger and other apps. 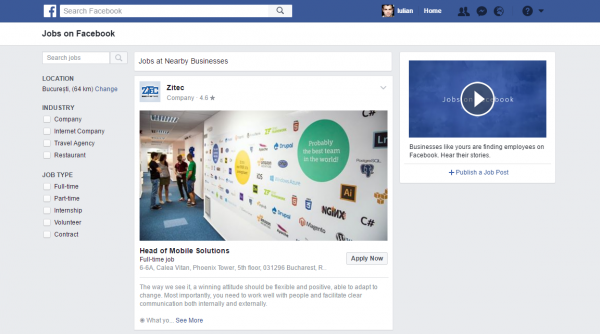 The newest feature offers business owners the ability to recruit employees directly through Facebook, by using this new section – Facebook Jobs. Sources like TechCrunch and TheNextWeb are seeing it as a direct competitor for LinkedIn’s Jobs, with a plus for lower-skilled workers, targeting businesses from all industries and allowing them to post job offers for as long as 30 days per opening. We had the opportunity to be one of the first companies in Romania to test out this new amazing feature and this is a screenshot of the current Facebook Jobs page for Bucharest. How does Facebook Jobs work? When the feature will be available for everyone (currently it’s available broadly in U.S.A. and Canada), the Jobs button will appear in the Explore menu, placed in the left side of the Timeline. For normal users, there will be displayed current jobs offers around their location, while for business owners (that have an active Facebook Page), there will be a special option, to Publish a Job Post. So if you’ll want to join the Zitec team, you can apply in your timeline! Facebook Users willing to apply for a job will have to press the Apply Now button and will have their personal information, experience and education pre-filled, making it much easier to apply, not having to deal with uploading of a resume and other complicated stuff. The application will go directly to that business page’s inbox, just like a normal message, labeled as “Job Application”. This feature is without a doubt a win-win for both businesses and job-seekers, having also the basic social abilities – to like, share or tag a friends in the Job Posting. At this moment, Facebook doesn’t charge any money to post job openings, but you still need to boost the post in order to reach bigger audiences and target specific people.